Pulaski County Courthouse, in downtown Little Rock. 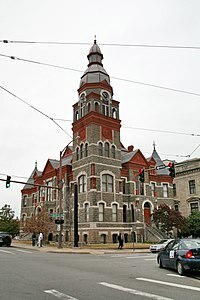 Pulaski County is the largest county by population in the U.S. state of Arkansas with a population of 382,748 at the 2010 United States Census. Its county seat is Little Rock, which is also Arkansas's capital and largest city. Pulaski County forms the core of the Little Rock–North Little Rock–Conway Metropolitan Statistical Area which had 699,757 people in the 2010 census. 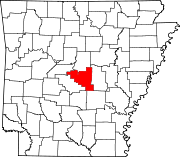 Pulaski County is Arkansas's fifth county, formed on December 15, 1818, alongside Clark and Hempstead counties. The county is named for Count Casimir Pulaski, a Polish volunteer who saved George Washington's life during the American Revolutionary War. According to the 2000 census, the county has a total area of 807.84 square miles (2,092.3 km2), of which 770.82 square miles (1,996.4 km2) (or 95.42%) is land and 37.02 square miles (95.9 km2) (or 4.58%) is water. An 1863 American Civil War battle, the Battle of Bayou Fourche, occurred in Pulaski County. Pulaski County is also home to Willow Springs Water Park, which is one of the oldest waterparks in the nation, opening in 1928. Evening at the original portion of the Pulaski County Courthouse, in downtown Little Rock. As of the census of 2000, there were 361,474 people, 147,942 households, and 95,718 families residing in the county. The population density was 469 people per square mile (181/km²). There were 161,135 housing units at an average density of 209 per square mile (81/km²). The racial makeup of the county was 63.96% White, 31.87% Black or African American, 0.39% Native American, 1.25% Asian, 0.04% Pacific Islander, 1.09% from other races, and 1.40% from two or more races. 2.44% of the population were Hispanic or Latino of any race. There were 147,942 households out of which 30.50% had children under the age of 18 living with them, 45.90% were married couples living together, 15.10% had a female householder with no husband present, and 35.30% were non-families. 30.00% of all households were made up of individuals and 8.80% had someone living alone who was 65 years of age or older. The average household size was 2.39 and the average family size was 2.98. In the county the population was spread out with 25.20% under the age of 18, 9.60% from 18 to 24, 31.10% from 25 to 44, 22.60% from 45 to 64, and 11.50% who were 65 years of age or older. The median age was 35 years. For every 100 females there were 92.00 males. For every 100 females age 18 and over, there were 88.20 males. The median income for a household in the county was $38,120, and the median income for a family was $46,523. Males had a median income of $33,131 versus $25,943 for females. The per capita income for the county was $21,466. About 10.40% of families and 13.30% of the population were below the poverty line, including 19.90% of those under age 18 and 9.80% of those age 65 or over. The Pulaski County Special School District is the county's public school district for 729 square miles (1,890 km2) surrounding Little Rock and North Little Rock, which maintain independent districts. Also the Little Rock School District and North Little Rock School District. Pulaski Technical College is a two-year community college and technical school that offers seven locations throughout the county, including a flagship campus in western North Little Rock. Four-year postsecondary institutions include the University of Arkansas at Little Rock, the University of Arkansas System's only metropolitan campus, the United Methodist Church-affiliated Philander Smith College, Arkansas Baptist College, and the University of Arkansas for Medical Sciences — all located in Little Rock. The Arkansas Department of Correction Wrightsville Unit is in Wrightsville. Townships in Arkansas are the divisions of a county. Each township includes unincorporated areas and some may have incorporated towns or cities within part of their space. Townships have limited purposes in modern times. However, the US Census does list Arkansas population based on townships (often referred to as "minor civil divisions"). Townships are also of value for historical purposes in terms of genealogical research. Each town or city is within one or more townships in an Arkansas county based on census maps. Pulaski County only has two townships, as of 2010. They are listed below. Source: "Census 2000 U.S. Gazetteer Files". U.S. Census Bureau, Geography Division. http://www.census.gov/geo/www/gazetteer/places2k.html. ^ "U.S. Decennial Census". Census.gov. http://www.census.gov/prod/www/decennial.html. Retrieved July 6, 2013. ^ "Annual Estimates of the Resident Population: April 1, 2010 to July 1, 2012". Census.gov. http://www.census.gov/popest/data/counties/totals/2012/CO-EST2012-alldata.html. Retrieved July 6, 2013. ^ Facilities 5. Arkansas Department of Corrections. Retrieved on March 8, 2011. ^ US Census Bureau. 2011 Boundary and Annexation Survey (BAS): Plaski County, AR (Map). http://www2.census.gov/geo/pvs/bas/bas11/st05_ar/cou/c05119_pulaski/BAS11C20511900000_000.pdf. Retrieved 20110824. This page uses content from the English language Wikipedia. The original content was at Pulaski County, Arkansas. The list of authors can be seen in the page history. As with this Familypedia wiki, the content of Wikipedia is available under the Creative Commons License.